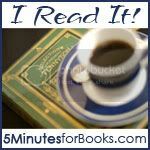 It's time again for another I Read It carnival over at 5 Minutes for Books where we invite you to link up book reviews for books you have read at another blogger's recommendation. We're always browsing each other's sites, but which books do you pick up and read at another person's urging? The I Read It carnival is a good opportunity to thank the reviewer, and share the book at the same time! This past month I kept seeing reviews pop up for Hotel on the Corner of Bitter and Sweet but the "selling review" for me was given by Anna over at Diary of Eccentric who was a bit too compelling for patience's sake. Anna reviewed this book in a manner that sowed discontent within myself. Oh no, I was so not going to wait to see if I would win a copy. I wasn't going to wait for our library to have a copy of it. I clicked right over to Amazon and ordered it for myself and it arrived during a bout with the stomach flu. Never was I more grateful for a distraction! What a great distraction it was too! In case you are unfamiliar with this book, boiled down to basics it tells the story of a young Chinese boy and a young Japanese girl who attend the same all-white school in Washington state during "the war years" (aka, World War II). Young Henry is forbidden by his father to have anything to do with any Japanese people but that doesn't stop him from befriending Keiko. He is loyal to her, to their friendship and to their budding romance even when her family is sent away to an internment camp in the height of Japanese hysteria, following the bombing at Pearl Harbor. This book is historical fiction with a little (extremely tame) romance and a mystery. Although Henry and Keiko fall in love, the war separates them and they end up leading different lives. Henry is grown now, recently widowed, and has a son of his own. He has no idea where Keiko is. All he has left are the memories of her, and author Jamie Ford does an expert job of weaving this story through time, taking us back and forth from the 1940's to 1986, where we find Henry alone and with his questions. I thought this book was superbly written, extremely compelling and, quite frankly, I couldn't put it down. (Thanks, Anna!) It was everything she said that it would be and I was not disappointed in the least. I try not to live in the past, he thought, but who knows, sometimes the past lives in me. As he left the hotel, Henry looked west to where the sun was setting, burnt sienna flooding the horizon. It reminded him that time was short, but that beautiful endings could still be found at the end of cold, dreary days. As to how believable the story was, I kept thinking about Stubborn Twig (click on the title to read my review of it over at 5 Minutes for Books). Stubborn Twig deals heavily with the issue of Japanese families in Oregon that were also sent to internment camps. The themes in the two books were similar. Yet one is truth and one is fiction. Both are sobering. It is hard to get one's mind around the idea that Americans would voluntarily and enthusiastically push to imprison large groups of immigrated (first and second generation American!) families into what were, essentially, prison camps. It just doesn't make any sense. In today's day and age, it's so very un-American. Yet suspecting other cultures and races is a part of our country's "heritage" if you will. We've come a long ways, but I do realize we have a little further to go. At any rate, if you read and liked Stubborn Twig you will very much enjoy Hotel on the Corner of Bitter and Sweet and vice versa. I'd even go so far as to say that if you liked The Guernsey Literary and Potato Pie Society then you will like Hotel. When I was browsing for books at our local Borders, the sales clerk told me that Hotel is the new Guernsey. I hate to cast doubt on Borders employees but since they seldom, if ever, know about the book titles I'm actually interested in purchasing, I eyed her with some amount of suspicion. (I did smile at her though.) However, in this case I think she hit the nail right on the end. It's that good. I have no hesitations in recommending this title. It is clean in every way shape and form. No language, no "scenes", just a good story that is set in a time period I enjoy. Yes, it is hard to think about the internment camps, but it's not always easy to talk about war either. Regardless, this book is magnificent and if I were in the habit of bestowing five stars around these parts, I'd give this particular book one hundred of them. Because it deserves it. My library has it! I've just added it to my list. Okay, I see a future "I Read It!" post coming. . . This sounds wonderful, and my library has it as well. Thanks for the recommendation! Sounds very good. I'm adding it to my list. You convinced me. Adding to my wishlist NOW. Hi Carrie...thanks for a great review! I'm glad you wrote about this book. I read it last year and I LOVED it! All of you who have decided to read it won't be sorry, I assure you. I also read Guernsey. Great book as well. I saw a great review as well, and ordered it right away. It's sitting on my shelf, but I think you're review helped me to put it to the top of my list. Great review! great review! Thanks for the heads up about the I Read It Carnival. I need to start keeping track of which blogger's review prompted me to pick up a book - I have picked up many on the recommendations of bloggers! I've heard a lot about this book, but could never quite decide if I wanted to read it. I'm glad that you can recommend it so strongly! I'm glad you enjoyed this one as much as I did! 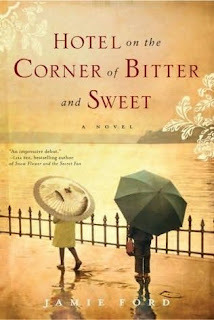 I read your review as I was preparing for our book club discussion about the Hotel on he Corner of Bitter and Sweet. I want to thank you for your insights and for putting so much of yourself into your writing. I get so bored with reviews that are nothing more than a rehash of the publisher's summary of the book. I will be back again and again to find out what you think about other books.